The kitchen should be light and airy. People, like plants, need a certain amount of heat and light. The kitchen windows should move easily at top and bottom. Windows which can be opened easily permit one the more readily to clear the room of an undue amount of heat or steam. The ceiling should be high, smooth, and free as possible from angles. The height will give better air, and the smoothness will lessen the amount of collecting dust and the trouble with house pests. It is well to have a ventilator in the roof by means of a skylight, when the kitchen is so situated that it can be done, as the odors will then escape more readily. There should be floor space sufficient for range, sink, cupboard, tables, etc., but no more than is necessary; otherwise, much extra walking is required in doing the work. A bare floor of hardwood is best, but it is expensive, and any bare floor requires much cleaning, though it is certainly more sanitary than one that is covered. Soft wood will splinter in time, and tiling is cold and hard on the feet, but is easily kept clean, and is very durable. If a covering is used, linoleum is better than oilcloth, because it is warmer for the feet, and wears well. If there is water in the house, so that a sink can be used, have an iron or a porcelain one, and a strainer screwed down, to prevent clogging the pipe. At a convenient place in the kitchen have a closet for kitchen tableware and other utensils. There should be two drawers for kitchen towels, etc. A small table on casters will be found very convenient for use when one is baking pies, etc., as it can be readily wheeled from pantry to range. It is also desirable to have a table near at hand when one is frying doughnuts, poaching eggs, or in fact doing any cooking on the top of the range. This table should be made of hardwood, that it may be easily cleaned, and should be covered with paper while in use. The range is a very important part of the kitchen furnishings and it is necessary that it be set in a place where the light from at least one window can shine full upon it, for there are cloudy days when it is impossible to cook successfully unless one can admit much light by adjusting window shades. 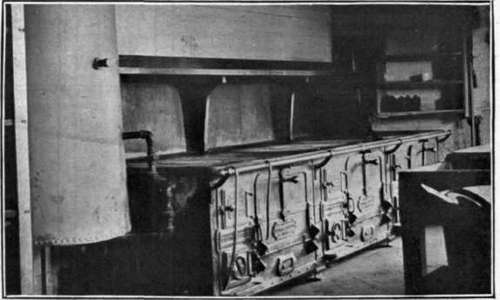 There are many patterns of stoves and ranges, each having its merits and demerits. The portable and set ranges will answer for a rough classification. Set ranges require less room, but are often necessarily in a dark place and can be approached from one side only. They consume much fuel and heat up slowly. The floor near them becomes hot and uncomfortable to the feet. A portable range can be placed so as to have better light than a set range, in some cases, and as it can be approached from more sides, less lifting of heavy vessels is necessary. It requires less fuel than a set range, heats up more quickly, but gives a smaller amount of hot water, and has some other disadvantages. 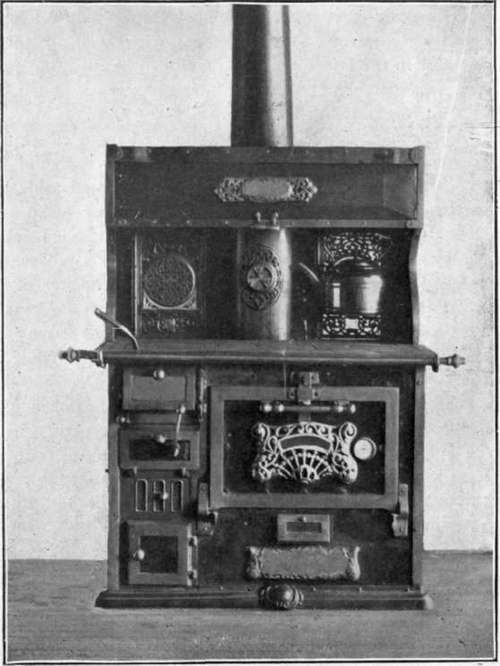 There are a few things that are necessary to the successful use of any stove or range: There must be a free draught, that the fire may burn readily; there should be several checks and dampers, that the user may be able to control the heat so as to consume no more fuel than is necessary, and also be able to direct the hot air into such parts of the range as are needed for use at the time. When the range is brought into the house, the user must at once make herself acquainted with its different dampers and checks, and study its inner construction, that she may know the use of all hot-air and smoke flues, and how to manage them. The reasons for this are obvious. The air and smoke always carry with them soot and ashes, which they deposit on the way to the top of the chimney. The soot and ashes must be removed frequently, else the range will cease to do good work. Water should never be allowed to fall on the range. If the range is hot, it is liable to break; if cold, there is danger of rust. When it is necessary to leave the kitchen for a few minutes, remove the cover from the teakettle to prevent it boiling over. When anything is spilled on the range, wipe it off at once. The top of the range can be kept in good condition by washing with dish water after rubbing with a piece of paper. Whether the range shall be blacked, each user must decide for herself. Polish gives it a more pleasing appearance, but is hard on the clothes of the one working about the stove.